Born in Siegen at the beginning of the seventeenth century, Johann Heinrich Bisterfeld was the second son of the theologian Johann Bisterfeld (c. 1568–1618) and Gertrud Schickhart. Bisterfeld studied at the Academia Nassauensis under Johann Heinrich Alsted, as well as in Basel, Geneva, Oxford, and in Leiden, before moving to Herborn as professor of Philosophy. In response to the invitation of Gábor Bethlen, prince of Transylvania (1580–1629), Bisterfeld, Alsted, and Philipp Ludwig Piscator travelled to Alba Iulia [Gyulafehérvár], and in 1629 took up positions as professors at the new Academia. This same year, Bisterfeld married Alsted’s daughter, Susanna. Thanks to his former colleague Andre Rivet, Bisterfeld was twice offered positions at Leiden (both of which he declined), but he remained in Alba Iulia until the end of his life, working as professor of theology and philosophy, as well as a diplomat and advisor. The author of a number of key publications, Bisterfeld maintained correspondences with a number of key scholars in the universities and learned circles of Western Europe, something his work and missions as a diplomat help to foster and maintain, and his correspondents included Claude Saumaise, Andre Rivet, Marin Mersenne, Joachim Jungius, Johannes Clauberg, Samuel Hartlib, Johann Amos Comenius, and John Dury. The two-volumed Bisterfeldius redivivus: seu Operum Joh. Henrici Bisterfeldii Magni Theologi ac Philosophi, posthumorum, which was published posthumously in 1661 in The Hague, proved a significant influence on Gottfried Wilhelm Leibniz. Dr Noémi Viskolcz is a Professor of the University of Miskolc, Hungary. Her main interests lie in early modern intellectual and cultural history. 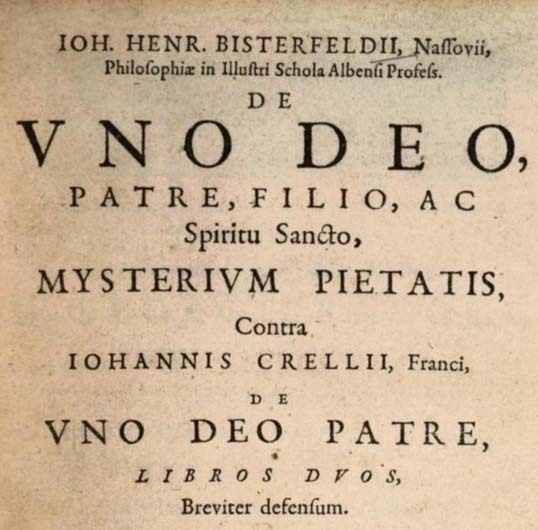 She is the author of four monographs: The Library of Johann Heinrich Bisterfeld (1605–1655) (Budapest, 2003); Plans to Renew the Evangelical Church in Germany in the Seventeenth Century (Budapest, 2006); Areas of patronage in the aristocratic court. The library of Ferenc Nádasdy (Budapest and Szeged, 2013); and The presses of Ferenc Nádasdy (Budapest, 2015). Cultures of Knowledge would like to thank Dr Viskolcz for contributing this metadata for Bisterfeld’s correspondence. Thanks are due also to Professor Robert Evans for his help with the Hungarian involved, to EMLO’s former visiting scholar Marc Kolakowski for his work to help prepare the metadata, and — as she worked on Cultures of Knowledge’s pilot prosopographical project — to Dr Iva Lelková for her assistance with a number of queries. The letters recorded in this catalogue, 121 in total, span the years from October 1624 to May 1656. Johann Heinrich Bisterfeld, Bisterfeldius redivivus: seu Operum John Henrici Bisterfeldii, 2 vols (The Hague, 1661). Volume I; Volume II. Maria Rosa Antognazza, ‘”Immeatio and emperichoresis”: the theological roots of harmony in Bisterfeld and Leibniz’, in The young Leibniz and his philosophy (1646–1676), ed. Stuart Brown (Dordrecht, 1999), pp. 41–64. Maria Rosa Antognazza, ‘Bisterfeld and “Immeatio”: origins of a key concept in the early modern doctrine of universal harmony In Spätrenaissance-Philosphie’, in Deutschland 1570–1650: Entwürfe zwischen Humanismus und Konfessionalisierung, okkulten Traditonen und Schulmetaphysik, ed. Martin Mulsow (Tübingen, 2009), pp. 57–83. Imre Bán, Apáczai Csere János (Budapest, 1958). Friedrich Cuno, ‘Johann Heinrich Bisterfeld’, Reformierte Kirchenzeitung (1882). Samu Gergely, ‘Rákóczy György összeköttetései Francziaországgal’, I–II Történelmi Tár (1889), pp. 686–707. Samu Gergely, ‘Rákóczy György összeköttetései Francziaországgal’, Történelmi Tár (1890), pp. 59–76. József Hajós, Barangolás kolozsvári könyvtárakban (Bucharest-Kolozsvár, 1999). Howard Hotson, ‘Johann Heinrich Alsteds Relations with Silesia, Bohemia and Moravia: Patronage, Piety and Pansophia’, Acta Comeniana, Internationale Revue für Studien über J. A. Comenius und Ideengeschichte der frühen Neuzeit, 12 (1997), pp. 11–35. Howard Hotson, Johann Heinrich Alsted, 1588–1638: between Renaissance and Reformation, and Universal Reform (Oxford and New York, 2000). Jan Kvačala, ed., Korrespondence Jana Amosa Komenského, 2 vols (Prague, 1897 and 1902). J. Kvačala, Die pädagogische Reform des Comenius in Deutschland bis zum Ausgange des XVII. Jahrhunderts, vol. I (Berlin, 1903). István Monok, ‘Johannes Henricus Bisterfeld és Enyedi György két levelezés-kiadásban’, Magyar Könyvszemle (1987), pp. 317–27. Adam Patera, ed., Korrespondence Jana Amosa Komenského (Prague, 1892). Régi Magyarországi Nyomtatványok / Res litteraria Hungariae vetus operum impressorum, vol. II. 1601-1635, ed. Gedeon Borsa, Ferenc Hervay, István Käfer (Budapest, 1983), vol. III, ed. János Heltai, Béla Holl, Illona Pavercsik, Judit Vásárhelyi (Budapest, 2000). A. Szilágyi, pub. Actes et Documents pour servir a l’Histoire de l’Alliance de George Rákóczy (Budapest, 1874). Sándor Toth, ‘Erdélyi matematikai kéziratok a 14–19. századból’, Magyar Könyvszemle (1991), pp. 175–206. József Koncz, ‘A Fehérvári Főiskola történetéhez’, Történelmi Tár (1884), pp. 199–201. Sándor Szilagyi, ed., ‘Okmánytár I. Rákóczy György svéd és francia szövetkezéseinek a történetéhez’, Monumenta Hungariae Historica, XXI (Budapest, 1873). Sándor Szilagyi, ‘Herczeg Rákóczy Zsigmond levelezése I-IX’, Történelmi Tár (1887), pp. 471–62 and 653–84. Sándor Szilagyi, ‘Okiratok a két Rákóczy György történetéhez’, Történelmi Tár (1887), pp. 209–42. Sándor Szilagyi, ‘Herczeg Rákóczy Zsigmond levelezése I-IX’, Történelmi Tár (1888), pp. 104–19 and 285–300. Sándor Szilagyi,‘Herczeg Rákóczy Zsigmond levelezése I-IX’, Történelmi Tár (1890), pp. 229–60, 424–55 and 597–636. Sándor Szilagyi, ‘Herczeg Rákóczy Zsigmond levelezése I-IX’, Történelmi Tár (1891), pp. 75–108 and 209–36. George Henry Turnbull, Hartlib, Dury and Comenius: gleanings from Hartlib’s papers (Liverpool), 1947. Noémi Viskolcz, ‘Johann Heinrich Bisterfeld és a gyulafehérvári tankönyvkiadás a XVII. században’, Magyar Könyvszemle (2002), pp. 249–71. Noémi Viskolcz, ‘Johann Heinrich Bisterfeld: ein Professor als Vermittler zwischen West und Ost an der siebenbürgischen Akademie in Weißenburg, 1630–1655’ in Calvin und Reformiertentum in Ungarn und Siebenbürgen: Helvetisches Bekenntnis, Ethnie und Politik vom 16. Jahrhundert bis 1918 (Münster, 2010), pp. 201–14. K. Wibling, ‘Magyarország történetét érdeklő okiratok a svédországi levéltárakból’, Történelmi Tár (1892), pp. 440–73 and 592–634. Ferencz Zimmermann, ‘Bisterfeld végrendelete’, Történelmi Tár (1893), pp. 171–5. ‘Johann Heinrich Bisterfeld (1605–1655)‘, in Post-Reformation Digital Library.